Are you planning a family road trip this Summer? Keeping the kids entertained during a long car trip is easy with these clever road trip games and activities! A big thank you to our friends at Melissa & Doug for sponsoring today’s play ideas! 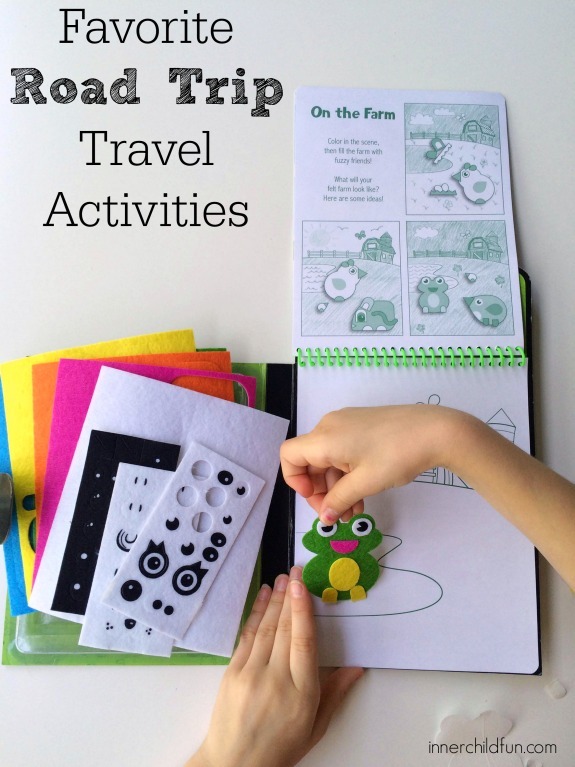 Here are some of our favorite ways to encourage creative play time fun during road trip travel adventures. It amazes me how something as simple as a sheet of paper can keep the kids entertained for long periods of time! Origami is a great activity to promote fine motor skills. All you need are some sheets of origami paper and a flat, hard surface (a lap desk works nicely for when in the car). The origami paper set from Melissa & Doug even comes with an illustrated instruction booklet with many simple projects the kids will love! My kids love to fold their own fortune tellers, butterflies, and even paper birds. Great simple no-mess fun! Ages 6 and up. If you are enjoying a bit of down time at the hotel during your family road trip adventure, these Craft On-the-Go Kits from Melissa and Doug offer lots of creative options! We especially love the felt friends sticker set and the clay creations set. If your kids enjoy doing craft projects at home, these sets are perfect for bringing crafty fun along with you. I love that each set contains all of the materials needed and has a handy storage compartment to keep it all neat and tidy! Ages 5 and up. Don’t let the name fool you because the entire family (boys included) will enjoy this deck of questions to get to know one another better. Some questions are silly and others are quite thought-provoking. The Family Road Trip Box of Questions edition is a playful way to encourage shy kids to open up and share things about themselves you may never otherwise get to know! Recommended for ages 8 and up. These puffy sticker play sets are wonderful for encouraging plenty of imaginative play time fun! My kids enjoy making up their own stories with these, and the stickers are reposition-able on the backgrounds making this play set a great value. There are lots of design options available, but my kids seem to enjoy the chipmunk treehouse version the best! Mix and match stickers from other puffy sticker play sets, and they will have even more ways to play. Disclosure: This post is sponsored by Melissa & Doug. All opinions are my own.